Your Online Store limits you to no more than three options for each product, but you can create up to 100 values for your entire store. This improves your store's online performance. And it's easier for your customers to buy products since they aren't overwhelmed by a long list of values. Note: What's the difference between a product option and an option value? Color is a single product option; Red, Yellow, Blue and Green are option values. Most store owners never exceed the 100 values limit. Here are two ways to accomplish that — while still providing customers an easier way to find the choices they want. Create product options Use general product options rather than super specific ones. For example, do not include the dimensions for every Small, Medium and Large choice you create. 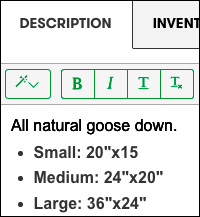 Instead tuck those details into the product description, such as these pillow dimensions. Create separate option values Create separate values for a product. 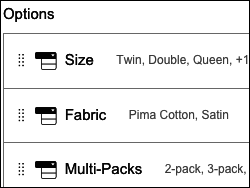 For example, you could use "Fabric" and "Multi-Packs" as pillow values, which give customers more choices.